"On 3 April 2007 The Sovereign Order of Saint John of Jerusalem, Knights of Malta, Federation of the Autonomous Priories donated a collection of medical instruments and equipments to the local hospital in Kukes, Albania in the value of HUF 75 million. (EUR 300.000,-). The donation was received on the Albanian side by H.E. ARBEN IVANAJ, Deputy Minister of Health and the State Secretary of the Ministry, H.E. JEMIN GJANA, Minister of Agriculture, representative of the area, as well as H.E. Sándor Szabó, the Hungarian Ambassador in Tirana. The donation has been initiated by Sir Dr. Péter VÁSÁRHELYI, Knight of Malta, member of the Hungarian Grand Priory. Sir Péter took care of the organization and also covered all expenses related to transport and services. 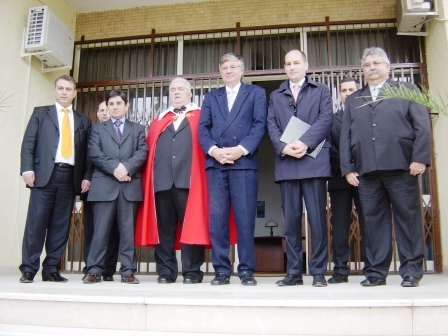 Sir Géza KÁLOVITS, Knight of Malta, member of the Hungarian Grand Priory took an active part in the reception and transfer of the shipment to the Albanian partners. The project has been coordinated by the Ministry of Foreign Affairs of the Sovereign Order. The Government of Albania has highly appreciated the gesture of the Order, which is a significant contribution to the development of health services in Albania. In the course of the preparations a meaningful dialogue has developed between the representatives of the Sovereign Order on the one hand and the representatives of the Ministry of Foreign Affairs and the Ministry of Health on the other. Hungarian experts will assemble and install the equipments, which will be followed by an official ceremony of donation in Tirana, capital of Albania, in the presence of a high level delegation of the Sovereign Order."